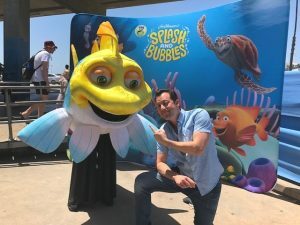 John Tartaglia, creator of the hit PBS Kids TV show “Splash and Bubbles” will appear at two FREE Barnes and Noble events this summer. Perhaps you can share the good news with your readers soon? I am attaching a photo of the new album and a pic of John at a recent event. (Photos Courtesy of the Jim Henson Company). June 23rd 11:00am-12: 30 pm – Barnes & Noble at The Grove. With an appearance, performance, and signing by John Tartaglia! Every day I keep wishing that one day they will make plush toys of Splash, Bubbles, Dunk, and Ripple that people like me will cherish forever! Having a plush toy of your favorite character is like getting to have them right at your side all the time!